The scruffy Guatemalan pointed his Smith & Wesson "38 Special" revolver at the gringo&apos;s belly. He was screaming in Spanish and gesturing angrily. He wanted the frightened American to get down on his knees right there in Sunshine&apos;s main saloon. Outside in the cockpit, Pirate No. 2 held a shotgun to the heads of the gringo&apos;s two teenage nephews. Pirate No. 3 carried a cutlass just like in the movies. "I was pretty sure I knew what that was all about. I was pretty sure he was going to shoot me," said Dan Caruso of Palmetto, Florida. But Caruso refused to kneel. "That was my only act of defiance," Caruso said. "I didn&apos;t want to cause any trouble, if there was any chance they were going to let us go. I didn&apos;t want to give them any reason to shoot...But when he started indicating he wanted me on my knees, I was just not going to do it. I wasn&apos;t going to let him shoot me like a dog. I started yelling at him." The crisis passed. The boys had remained remarkably calm throughout. The attackers continued to ransack the boat, loading their 25-foot canoe with everything not bolted down, then motored into the night toward the mouth of a secluded creek and into Guatemala&apos;s Lake Izabal. The pirates had seemed inexplicably pressed for time, given that Caruso had anchored way up Ensenda Los Lagartos, a creek far from settlements or other cruising boats. A couple of hours earlier Caruso and the boys had delighted in the isolation of the jungle with its platoons of howler monkeys. The pirates&apos; choice of booty had seemed strange, indeed. For example, Caruso was carrying a collection of logo baseball caps. The pirates took them all. They took portable electronics, binoculars, TVs, VCRs, five cameras, lenses, diving gear and a 9.9hp Nissan outboard. They took $5,000 in cash, but Caruso had subdivided his cruising kitty, and the pirates missed other monies. One of the pirates had thrown some foul-weather gear into the canoe, but the leader tossed it out. The pirates had left behind the boat&apos;s fixed-mount electronics because of their hurry and the likely absence of native market for such devices. Still, Caruso valued the haul at $12,000 to $13,000. As they left Sunshine, the leader pointed his gun once again. "No policia," he shouted. "I shoot you, tell policia." Fearing the gang might return, Caruso weighed anchor and motored his 55-foot custom catamaran back into Lake Izabal to anchor for the night. They next day, they continued another 18 nautical miles to Las Fronteras, where they reported the attack to police. The policeman taking the report suggested the pirates had been from the village of El Estor. Caruso rented a truck and drove there but saw no one resembling his attackers. Movie pirates are usually depicted as large organizations manning ships big enough to battle naval vessels, but the reality has always been closer to Caruso&apos;s experience. More often they were small groups of desperate men using guile and surprise against isolated, damaged or otherwise vulnerable vessels-like wolves culling the injured members of a herd. These Guatemalan villains, for example, were well aware of the cruising community&apos;s dedication to the principle of helping one another in times of need. They were also aware that in Guatemala, as in many Latin countries, foreigners must check in their firearms at the port of entry on pain of imprisonment and vessel confiscation. In retrospect, Caruso said he was embarrassed at how easy he was "snookered." So commonplace are outboard-powered canoes that Caruso believes he was lulled by the ordinary nature of the prelude. "They must have had a way to make the engine sound like it was dying, like there was something wrong with it," Caruso said. "Their engine quit, and they pulled and pulled on the rope and couldn&apos;t get it going. Me, being who I am, I&apos;m always willing to help people...So they paddled up to the cat, and I actually helped them work on their engine." With no success on the engine, Caruso agreed to tow the Guatemalans home with his dinghy. "When I turned to walk away from him, the two boys kind of walked with me," Caruso said. "As soon as I turned my back-and to this day I don&apos;t know where they hid their weapons-the next thing you know I heard two shots fired in the air, and they just overran us in seconds." The attack on Caruso and his nephews, Ben and Paul, happened in early summer 2001. They were neither the first nor last to be victimized by pirates in eastern Guatemala. More is the pity because the Rio Dulce is such a stunningly beautiful destination. PMM research revealed several attacks there over the past few years, the latest of which occurred off the coast last August. According to the U.S. embassy, a foreign-flagged vessel reported being attacked by another boat, whose attempts at boarding were repelled. In 2000, armed men hijacked a commuter ferry and gunned down five people. That same year a cruiser at anchor on the Rio Dulce was found shot to death. "While violent criminal activity has been a problem in Guatemala for years, there has been a substantial increase in criminal violence in 2001, including numerous murders, rapes and armed assaults against foreigners. The police force is young, inexperienced and under-funded and the judicial system is weak, overcrowded and inefficient. Criminals, armed with an impressive array of weapons, know that there is little chance they will be caught and punished for their crimes." The embassy recommends that visitors "exercise caution" in the Rio Dulce area: "Widespread illegal activities, such as narcotics smuggling, have increased insecurity in this remote area." According to the embassy, several U.S. citizens in Guatemala have been murdered, and none of their killers has been arrested. Caruso&apos;s story is an instructive one. On the simplest level, cruisers might choose to avoid eastern Guatemala altogether. So wonderful a place is the Rio Dulce, however, that Caruso is planning another trip there with his nephews. Next time, he said, Sunshine will buddy-boat anywhere away from settlements. Others might see this as an argument for firearms. Caruso obeyed Guatemalan law and checked his at the gate. Take a chance and keep a hidden gun? Any gringo caught with a gun might suddenly find that "weak and underfunded" judicial system transformed into a model of rectitude and efficiency. Hide the gun really well, and it probably won&apos;t be much use in an ambush anyway. In any event, the point of this article is not to re-ignite the eternal gunsand- boats debate. Besides buddy-boating, the best nonlethal countermeasure may well be modern communication. Whenever you travel to remote waters, familiarize yourself with the local cruisers&apos; VHF net, if one exists, and inform friendly ex-pat liveaboards of your gunkholing plans. If possible, activate your cell phone for the local area and program it with phone numbers for local authorities and prominent marinas. When anchored or under way alone in areas VHF to feign the presence of other vessels. If you have a satellite phone, have your crew ready to call the nearest Coast Guard station at the first sign of trouble, even if you&apos;re 600 miles away. You never know when the U.S. cavalry may be just over the horizon-and with airpower. This can also work near-shore with that activated cell phone. In olden days, pirates were hanged. In modern Guatemala and other parts of Latin America, pirates caught in the act are likely to meet the same fate but with a government bullet instead of a rope. TO CALL THE "WAR ON DRUGS" A WAR MISUNDERSTANDS THE FORMER AND TRIVIALIZES THE latter, as all Americans should realize in the aftermath of Sept. 11. A war is a life-and-death struggle between rival nations or ideologies. The War on Drugs is the age-old, high-stakes hide-and-seek between smugglers and cops. As in the Prohibition Era, traffickers risk their fortunes and personal liberty; law enforcement officers stake their careers, and those not grown cynical believe the health of America, too, is at stake. Now as then, players sometimes get killed. If anything, today&apos;s game is nastier. 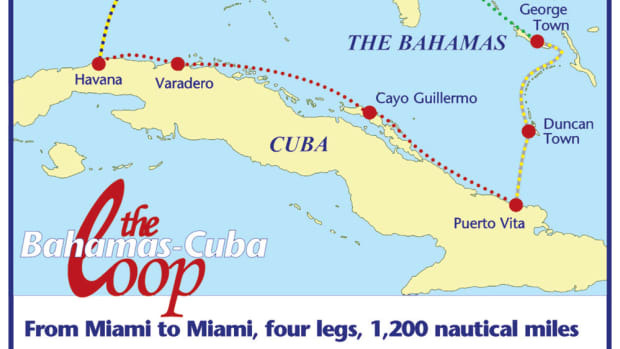 Sadly for us, it&apos;s being played out over two of the world&apos;s best cruising grounds-the Bahamas and the Caribbean. Growing numbers of drug seizures at sea suggest that Bahamian smuggling routes are becoming increasingly active, returning to levels last seen in the cocaine &apos;80s. And seizures off the West Coast are even bigger than those in the islands. Last fall, U.S. drug officials announced an alltime record in maritime cocaine seizures for the year ending on Oct. 1. The U.S. Coast Guard had seized 138,334 pounds of cocaine, compared to 132,480 pounds for fiscal year 2000, which itself was a record. Capt. Joseph Conroy, the Coast Guard&apos;s chief of law enforcement, called this trend an "alarming expansion." Heightened security since Sept. 11 appears to have had little effect on the flow. Although fiction, the plot of Sheryl Jane Stafford&apos;s A Deadly Exchange (see author&apos;s account on Page 114 of this issue) is entirely plausible: An innocent couple cruising the Bahamas accidentally find themselves in the middle of a drug deal. As alarming as this scenario may sound, however, Stafford would tell you that the Bahamas continue to be safe for travel. But like listening to the weather radio, prudent mariners should avoid trouble by exercising the same sense of vigilance toward the human landscape. The threat to cruisers is threefold: 1. accidentally happening upon a drug offload in progress; 2. having your boat stolen or hijacked for the purpose of drug smuggling; and 3. having your boat boarded by pirates for kidnapping and ransom, or just plain thievery, which was the case in the accompanying story "Piracy on the Rio Dulce." The first example-accidentally stumbling upon an offload in progress-is probably the scariest. In the 1980s three people were killed execution-style when they inadvertently came upon an offload in the Florida Panhandle. The reality is, however, that the smugglers are going to try to do everything in their power to keep you or anyone else from seeing what they are doing. The success of their operation depends upon that very concept. So if it is any solace, they are trying just as hard, or harder than you are, not to be seen by you. Where to look for an offload? They occur in hidden mangrove coves, isolated islands, city harbors, industrial docks, far offshore and inshore. In other words, they could occur anywhere, so it is virtually impossible to plan ahead of time to avoid such an occurrence. To stumble upon an offload is the essence of bad luck. Knowing what to look for might help a little bit. The use of several small high-speed offshore racing-type boats is a fairly common method used today, especially in the Bahamas and south Florida. Several speedboats will converge on a larger mothership for offloading. Once loaded, the speedboats scatter in all directions, much like a covey of quail. Law enforcement might be able to intercept a few, but some will most likely get through. Try to avoid anything resembling the start of an offshore boat race, far offshore. Use some street smarts; if a place "just feels wrong," maybe it&apos;s time to weigh anchor. The skipper decided he didn&apos;t need fuel that badly, cast off and never looked back. The second scenario, and one that used to be a fairly common occurrence 20 years ago, is the threat of having your boat stolen for the purpose of being pressed into service for smuggling. Assuming that the high-speed ocean racer is currently the boat of choice for smuggling offloads, this scenario would seem unlikely. Not that displacement-speed boats are not being used to smuggle. We suspect that if they are, they are used at the "point of origin" and would, in turn, be offloaded at sea in the Bahamas or south Florida. So if your trawler is stolen in the Bahamas, it is most likely for the electronics and hardware on board. The third possibility, that is, being boarded by pirates intent on kidnapping for ransom or just plain robbery, is a threat in the extreme southern reaches of the Caribbean up to Belize, but extremely rare in the Bahamas. It is worth noting that the Bahamas, particularly its outer islands, are a smuggler-friendly environment. Early on, smuggling replaced piracy as the prime money-earning activity. By comparison, tourism has barely a toehold in the remotest reaches of the 700-island chain. In November 1998, the Bahamas National Crime Commission reported an alarming revival of smuggling in the same outer islands that had been a problem during the trafficking surge of the 1980s. "The committee was distressed to discern an attitude among the residents that, rather than take steps to improve their obviously deteriorating economic circumstances, they preferred to await the next boom time for drugs which was bound to come," the commissioners wrote. The commissioners lamented that drug smuggling could not succeed were it not for the "support of the community" and wrote: "Police complain of the reluctance of residents to provide information and otherwise assist in the prevention and detection of crimes, while the residents complain that the police are corrupt and cannot be trusted." Anyone cruising through these islands is struck by the religious fervor of the inhabitants, who dress for church with coat-and-tie formality despite the heat of the tropical summer. It is amusing to imagine that once the choir is silent and the suits back on hangers, the parishioners scatter to load skiffs with 55-gallon drums of gasoline for the go-fast boats hidden in mangroves. Fact is, many islanders view the forces of OPBAT, a joint U.S.-Bahamas law enforcement team that includes the U.S. Coast Guard and DEA, as an occupying force that swoops over their islands in menacing black helicopters. The smugglers, by way of contrast, are often seen as benefactors. And that&apos;s why this isn&apos;t war; it&apos;s muddle.